Electricity has been out here since a storm on Friday, and the outage is expected to last at least one more day. The loss of power delays the launch of the channel cards for this year’s March of Trash, but it gives me a chance to focus on freezers. In an extended power outage, almost everyone can expect a problem in the freezer. Food in a freezer may stay frozen for a couple of days without electricity, assuming you can keep the freezer door closed. Any longer than that and you may be throwing it all away. 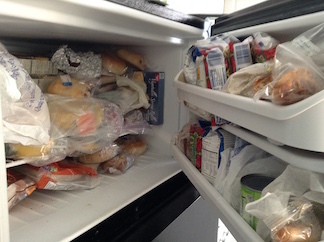 I checked my freezer 40 hours into the outage, and the food was generally still frozen. Most of it looked like it would get through another day, but there was some that I thought I should take out. The theme of this month is that you have choices when you get rid of things, and you can see that even in this unusual situation. I took ice cream to the compost heap, then put the carton in the trash. There was some food I thought I could consume today and some that I could give away. The local power company says it expects to restore power in another 24 hours. If the outage goes longer than that, I may not be able to keep much of anything from the freezer. If it comes to that, I may just get a large trash bag and throw everything in. This imaginary scenario illustrates one of the key advantages of the refuse channel for trash. It can go quickly. When you are forced to move quickly, you’ll probably be putting a lot of things in the trash. When you have the luxury of time, you can consider items one by one and determine the best disposition for each one. An extended power failure is uncommon, but it will happen eventually. Living in a tree-heavy suburb with above-ground power lines, I have been through four or five extended power failures over the last 12 years. Remember this risk when you are tempted to load up your freezer with something. There is a small but significant chance that you will lose it all in a power failure. Most of the food in my freezer was given to me, but even so, this outage is a reminder not to push my luck when it comes to storing frozen food. Assuming that power is restored soon enough, I should plan to eat most of the frozen food I have before the harvest season arrives. Frozen food is a boon in the winter and early spring, but I know from experience that when I have fresh local produce in the house, I lose most of my interest in packaged and frozen food.